We are loving this bookcase from Tema. It's huge (75" tall, 120" wide) and it's so cool-looking. It comes only in pure white. Because of the size, we thought it would be great if you have a large wall that you need to fill-- like in a loft perhaps? Sorry for the quality of the picture, we coudn't get a larger image from the manufacturer. But here's the catch, you have to assemble it. If you are handy, it should be no problem at all as it comes with detailed assembly instructions. If you are not, well, we recommend hiring a really good handyman. 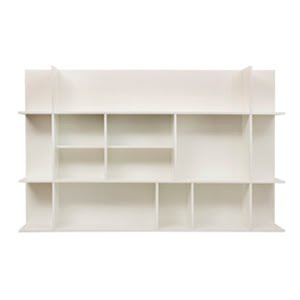 Most importantly, this bookcase is really inexpensive. The list price is $888 plus shipping (we can help you get it for less). Email us if you need help.